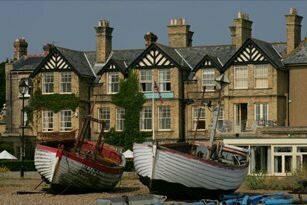 The Wentworth Hotel is a family owned and run establishment in the picturesque Suffolk Coastal town of Aldeburgh. With 35 bedrooms, spacious lounges, a 2AA rosette restaurant and open fires in the colder months, it is the ideal retreat for those wanting to relax by the sea. The Wentworth is a stone's throw from the beach so take advantage of luxury accommodation with seaviews. The seaview rooms are all equipped with binoculars so that you may savour the picturesque coast. For a real treat why not try one of our superior rooms with a seperate lounge area? The 2AA rosette restaurant is open for breakfast, lunch and dinner. For breakfast enjoy a buffet of local produce including Suffolk yoghurt, fresh fruit, homemade muesli and fresh bread. Follow this with a cooked English breakfast or local Smoked Haddock. A vegetarian option is always available. Dinner time is from 7pm and the restaurant offers traditional English cuisine with a hint of French influences and contemporary touches. 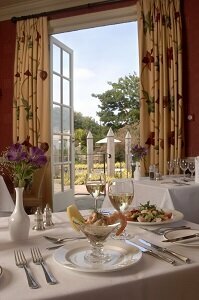 The restaurant is elegant and stylish giving you a wonderful dining experience - candle-lit in the darker months. The two spacious lounges in the hotel are ideal to relax in. Sit in the conservatory during the summer or by one of the three open fires in the winter. Afternoon teas are served so why not enjoy homemade scones with clotted cream and jam or a cucumber sandwich. Delightful during the summer months outside on the sun drenched terrace. The gallery is also ideal for exhibitions, clubs and seminars. Come & join us for a break on the Suffolk Coast & let us take care of you! Sunday nights in the restaurant - unbelievable value at £16.90 for three courses. Booking ahead is advisable! Dinner from Monday to Saturday is still very reasonably priced - £26.50 for three courses. We have a 2 rosette restaurant. 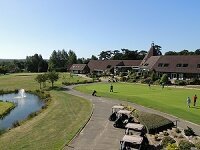 Add yourself to our emailing list to receive details of all special offers and events including reduced late tariffs on accommodation.